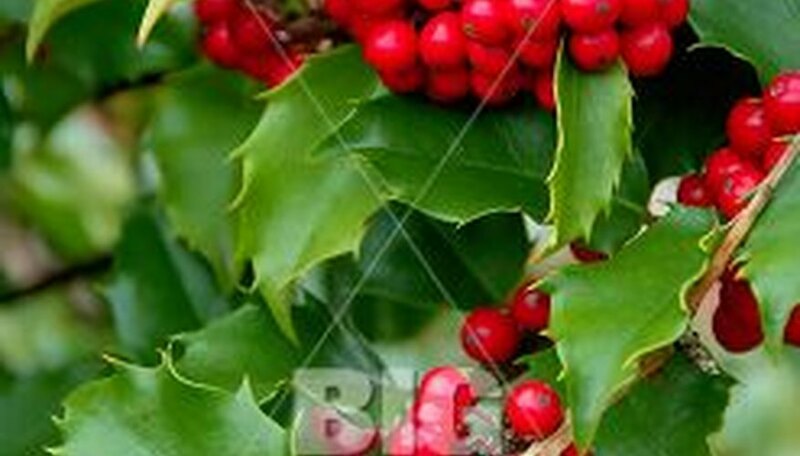 Winterberry shrub is the formal name for holly, which is usually found at Christmas hanging on a wreath. The plant has dark green leaves, white flowers and bright red berries that are extremely attractive to birds. Because the winterberry shrub has male and female flowers found on different plants, it is best to plant them near each other so they can easily be pollinated by insects. The winterberry shrub doesn't need much pruning, but it can be shaped without causing damage. Prune your winterberry shrubs in spring to encourage a large production of berries. Wipe down your garden snips with a sanitizer, such as bleach or rubbing alcohol, to prevent spreading any plant diseases. Decide on the shape for your winterberry and remove branches or parts of branches to attain the shape. Winterberry shrubs do not need pruning for strong growth. Pruning is usually done for aesthetic purposes only. Remove any droopy branches that hang over walkways so the winterberry shrubs do not hinder pedestrians. Snip off the damaged and broken branches. Winterberry bark is thin and damages easily upon impact. Cut away any branches that impede a path or doorway the winterberry is growing near so as to not hinder any pedestrians. Snip off any broken, damaged or sagging branches. Since winterberry bark is very thin, the limbs can become easily damaged and snap away. Remove any limbs that jut out from the general form you are trying to achieve. Winterberry shrubs can be trimmed into any shape without much difficulty. Remove any diseased or damaged shoots by cutting them back to a main branch. Remove any growth that is not in keeping with the desired shape of the winterberry shrub. Snip shoots back to the length or height desired. Rake up all pruning debris and bag it. Lay down a fresh 3-inch layer of mulch, 2 inches from the base of the shrub and spread it 1 foot past the dripline. Dig your planting hole 4 times the width of the root ball and equal in depth. Prepare the shrub for planting by removing any string or wire around the branches or trunk. Cut away at least half of the burlap around the root ball. Place the shrub in the planting hole and fill with water. Allow time for the root ball and surrounding soil to absorb. Pulverize the original soil with your shovel if it is clumped. Backfill into the planting hole and water again deeply. Spread a generous layer of mulch, 2 to 4 inches, around the base of the shrub and covering the entire planting area.